How many acres will American Prairie Reserve comprise when it's complete? Why this size? The goal of American Prairie Reserve (APR) is to create the largest wildlife reserve in the lower forty-eight states, consisting of approximately 3.5 million acres of both private and public lands. The Reserve intends to acquire and manage approximately 500,000 private acres, which will serve to glue together roughly three million acres of existing public land. Management of the eventual wildlife complex will be conducted by the various entities with land ownership and wildlife management authority including the U.S. Fish and Wildlife Service, U.S. Bureau of Land Management, Montana Department of State Lands, Montana Fish, Wildlife & Parks and American Prairie Reserve. Conservation biologists have determined that a mixed-grass prairie would need to be approximately 5,000 square miles (roughly 3.2 million acres) in size in order to be a fully functioning ecosystem that supports the full complement of native prairie biodiversity and provides room to endure episodic localized natural phenomena like fire, disease and severe winter storms. The Reserve currently stewards more than 399,000 acres of deeded private land and leased public land. Why has APR chosen this particular region in Montana as the location for its prairie restoration efforts? Temperate grasslands are the least protected biome on Earth, and scientists have identified that are only four places left across the world where landscape-scale conservation of grasslands is still possible. One such place is the six-country region of American Prairie Reserve on Montana’s Northern Plains, which was once home to such abundant wildlife that people traveled here by foot, canoe, steamboat, horse, wagon, and train just to witness a piece of authentic America. The region also possesses unique characteristics that make it an ideal location to restore a fully functioning prairie ecosystem in modern times. First, there are unusually large tracts of public land in the region, and by buying small amounts of deeded land, American Prairie Reserve can glue together existing public lands in order to create a seamlessly managed wildlife complex. Second, northeastern Montana holds one of the largest areas of intact prairie in the country. Habitat restoration is far easier here than in other parts of the Great Plains where much of the native sod has been plowed under. Third, numerous scientific studies have identified this region as having some of the greatest plant and animal diversity anywhere in the Great Plains. Most animal species that existed here two hundred years ago are still here, although in reduced numbers, and the region is known for its diversity of prairie birds. How does APR buy land and work with landowners? American Prairie Reserve purchases private land from willing sellers in the region using market studies and appraisals to inform purchase price decisions. APR pays property taxes on all lands owned by the organization. When working with local sellers our intent is to be as flexible as possible in order to meet the unique circumstances that each landowner may face, and APR utilizes different tools depending on the specific situation. These include, but are not limited to, livestock leases and contract purchase, exchanges, tax and estate planning tools and other approaches that may benefit the seller. How does APR use conservation easements? American Prairie Reserve has placed conservation easements on some of its deeded land. A conservation easement is a legal agreement that limits the uses that can occur on a property. Many conservation projects utilize conservation easements to protect wildlife corridors and habitat, scenic vistas, and other natural and historic values. The main motivation for this is to ensure the long-term protection of grassland habitat by prohibiting plowing of native prairie, development, fragmentation and other activities that alter wildlife habitat. Some conservation easements also ensure public access. To date, the Reserve has worked with Montana Department of Fish, Wildlife & Parks and Montana Land Reliance on developing conservation easements on a few parcels of the Reserve. We are often asked why we are buying land instead of just using conservation easements as a tool. The most effective way to fulfill the mission of creating a large reserve open to the public is to own the land. It would be a much more difficult process to convince neighboring landowners to grant conservation easements in perpetuity, allow public access, be welcoming to the full array of prairie species, and refrain from conducting other management practices that are not compatible with a large area specifically devoted to a prairie-based nature reserve. Does APR plan to keep the land, or will it eventually be turned over to the government? American Prairie Reserve intends to hold title to its private lands in perpetuity. In order for the Reserve to last hundreds of years into the future, we believe the best system of management will be a public-private collaboration. The land management agencies involved in the area are the Bureau of Land Management, Montana Fish, Wildlife & Parks, the U.S. Fish and Wildlife Service, and the Montana Department of State Lands. We think owning our lands and cooperatively managing the habitat with these agencies will create a unique system of accountability and checks and balances. What are the advantages of a private effort like APR? Management of private lands by a private entity like American Prairie Reserve has advantages over publicly managed lands. For instance, we can make and carry out decisions on our private lands that improve habitat and encourage public access much quicker than a public agency can. We are also free to focus our land management decisions exclusively on benefiting wildlife and the public’s enjoyment of it. We think this management focus will complement the management on surrounding public lands. We also believe there will be benefits to having a well-endowed private entity (APR) as the owner of hundreds of thousands of acres marbled through the Reserve’s millions of acres of public lands. From time-to-time governments struggle to fully fund large-scale parks and recreation areas, sometimes even needing to close them temporarily due to insufficient operational funds. American Prairie Reserve’s endowment is intended to help keep at least the Reserve’s private acres in strong financial shape well into the future. What is APR’s position on new National Monuments? 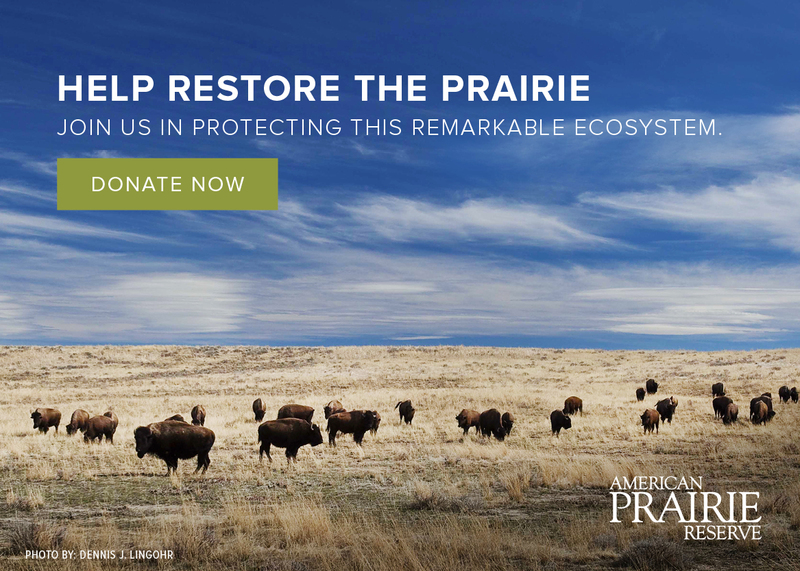 American Prairie Reserve is a private nonprofit whose mission is to assemble enough land to create a fully functioning nature reserve. We do not have a position on new national monuments.